OpenStax offers free access to high-quality textbooks in core subject areas. View resources by subject, including humanities and AP options. View books online or download in PDF format. The search options in the online viewer allow users to locate content easily in the digital format. Use OpenStax textbooks to dig deeper into core subjects such as math, science, and social studies. Use materials to differentiate instruction based on student abilities and interests. If your current textbooks are older, find newer books on OpenStax and adopt them for your curriculum. Take advantage of the search feature of online books to find supplemental material for your current instruction. Find teaching materials for gifted students using OpenStax textbooks. OpenEd was acquired by Act Academy enabling their catalog of resources to be embedded inside any ed tech product including Renaissance Learning, Agilix, Pearson, Canvas, Schoology, Google, Microsoft, and more. OpenEd Powered by ACT claims to be the world's largest online library of free education resources - videos, lesson plans, assessments, games, and more. Sign in with email to get started. There are several ways to register students: manually with email and password, give them a code, or upload students from Google Classroom, Canvas, or Edmodo. Once signed in, click the Resource Library tab in the top menu (or preview it here). Search the resources with a keyword and filter by grade, subject, standard, resource type, or publisher. Save for later use, or assign to all students or just a few. In the assessment area, a convenient feature is the ability for the teacher to assign videos to the student for review if they answered questions incorrectly. Then the student can try again. The videos are hosted on YouTube. If your district blocks YouTube, then they may not be viewable; be sure to look at alternatives for sharing the videos on classroom computers. With 90% of the million resources free, you're sure to find something you need to supplement current curriculum materials. Replace pen and paper and ask questions and have students respond directly on any video you used choose. Use VideoAnt, reviewed here, for this purpose, and then use the video at a learning center or station during any unit or for review. Use activities from this site to differentiate learning within your classroom. Try flipping class and assign videos, slides or lessons to be completed at home and have a discussion (or question and answer session) about them the next day in class. Include this site on the class website for parents to find at-home math, language arts, science projects, and materials for review. Be sure to share with other teachers on campus. Reading Friend offers an extensive library of free animated books, songs, poems, and learning activities for emerging readers. Choose from categories on the home page, the main catalog listing, or search by keyword. Words are highlighted as the narrator reads. Most, but not all, content is friendly on mobile devices. Use Reading Friend to find and differentiate literacy activities for students. Share links to books and activities on classroom computers for student use as centers. Include a link to activities on your class web page for use at home. Many of the stories and poems will help resource and ELL/ESL students who need to hear word families, phonetics, and such. Tarr's Toolbox contains many quick and easy suggestions for spicing up lessons. Although created by a history teacher, most ideas can easily adapt to any subject. Click on any text box for a complete description of activities. Some of the descriptions have suggestions for use of the tools found on Classtools, reviewed here. Be sure to subscribe to Tarr's Toolbox blog to receive updates as new ideas are added. Bookmark this excellent resource to use when looking for new ideas for your classroom. Choose from ideas such as "Hands up if you DON'T know" or "Sock puppets in the secondary classroom" to inspire and motivate your students. Look to this blog to differentiate for students of all levels. Divide students into cooperative learning groups using different ideas found on Tarr's Toolbox. Easily personalize and practice vocabulary with Vocabulist. Upload a file from your computer or copy and paste text into Vocabulist. Wait a minute or two for your document to process. When finished Vocabulist provides a list with each word and its definition. Choose the correct definition when necessary from drop boxes or provide your own definition. When finished, export as a PDF to your computer or directly into Quizlet, reviewed here, to use as flashcards. Vocabulist is perfect for differentiated learning. Create individual student vocabulary and spelling lists based on student needs. Create lists for difficult vocabulary from any text or for any subject. Be sure to share a link on your class website for students to use at home to create study guides throughout the year. Sign up for ThinkCerca's eight free starter lessons and get your students on the road to better critical thinking, close reading, and academic writing. Find a starter kit with 8 lessons teaching students the art of argumentation. Each lesson is 30 minutes long. These lessons contain standards-aligned literacy concepts and vocabulary. Start with Cerca's baseline assessment for writing, and then proceed with the lessons in order since the lessons build on each other. Sign up with your email, first and last name, and school zip code. Create your class or classes, and have students enroll via a class code. Find prompts for ELA, Science, and Social Studies. and Math. The support section has several categories which include specific help directions, and also includes Instructional Strategies, Personalized Learning Models, and Tips and Resources. Students will need to click Sign Up and "I'm a Student." Students will enter their first name and last name so be sure you have parent permission. They will also need an email address. There is a work-a-round for the names and email address. For the first and last name you could have them enter a code, for example, the first two letters of their last name and first three letters of their first name. If students cannot have their own email accounts, ThinkCerca has a suggestion or consider using a "class set" of Gmail subaccounts, explained here; this tells how to set up Gmail subaccounts to use for any online membership service. Once your students have worked through the eight lessons here, you may want to look at 301 Prompts for Argumentative/Persuasive Writing, reviewed here, to help you differentiate future writing lessons. Let Outwhiz replace your tired worksheets! Practice math and English with over 200 topics and hundreds of questions per topic. Earn points, move up levels, and earn badges. Sign up with email. At the time of this review, the math levels are for grades K-8, and the English levels are 1-6, with the promise of grades 7-12 coming soon. Outwhiz, in a nutshell, is adaptive learning, gamification, and includes unlimited exercises, all for FREE! The gamification of the material on Outwhiz is sure to catch your student's interest! Sign up using your email and create a class. Give students the URL and class code to join. At the end of an introduction of a concept, use this site for specific language arts or math practice. Use Outwhiz for homework, review, and reinforcement of any math or language arts concept. Use this site to differentiate for students of all levels. Create a link to Outwhiz on classroom computers to use as math and language arts centers/stations. Put a link to this site on your classroom website or newsletter as a resource for math and language practice at home. Share this site as a way to review before tests. ESL/ELL and resource teachers will find Outwhiz to be extremely helpful for reinforcing language and math concepts. Track learning in real-time with Quizalize. Student answers are color-coded on the teacher dashboard for ease in identifying who needs more help. Create scrambled word or multiple choice questions, and each question can have a custom timer. View reports for each student's progress and learning gaps. Create a quiz or select one from Quizalize's growing library. Quizzes can be "gamified" by showing the teacher dashboard as a leaderboard to see progress against other users. Quizalize works on any device with a browser and Internet connection. Sign up with an email and password. Create a quiz, assign it to classes, get a code, give it to students, and let the fun begin! Make a class challenge! Create practice quizzes to review the material just learned in class. Use an interactive whiteboard or projector for students to view the "leaderboard" (teacher dashboard) as in a game. 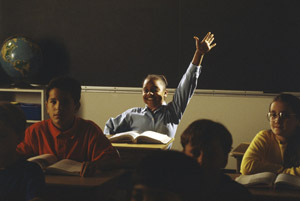 Students score more points by answering questions quickly. As with other tools with a leaderboard, it is helpful to have a collaborative environment where competition is not the goal, instead working together and improving is important. Use Quizalize as a formative assessment and to differentiate to see what material needs more review with classes (or individual students). Use this tool often to obtain a snapshot of each student's understanding of content (subtopic/standards); quickly see who understands a concept and who needs some individualized practice. Share with students as a resource for creating quizzes for studying at home. When students are using surveys and polls for reports, introduce them to Quizalize since it works on any device. Share quizzes with your fellow teachers.